Many are sure having a hard time laying hands upon the new Xiaomi Redmi Note 4G and hence, the Chinese smartphone giant has decided to offer the device this weekend,minus any registration! They have announced that the devices would be available for sale from January 24 till January 26, and are part of the Republic Day sale. The company also revealed that this is an open sale for all and there’s no specific time as to when the device will be available. It is to be noted that people willing to lay hands on the device can either get it through Flipkart or any of the Airtel stores in select cities, where the company holds weekly flash sales. Although Xiaomi hasn’t quite announced the total number of handsets that will be made available for the sale, sources suggest that they are likely to ship in a massive inventory. 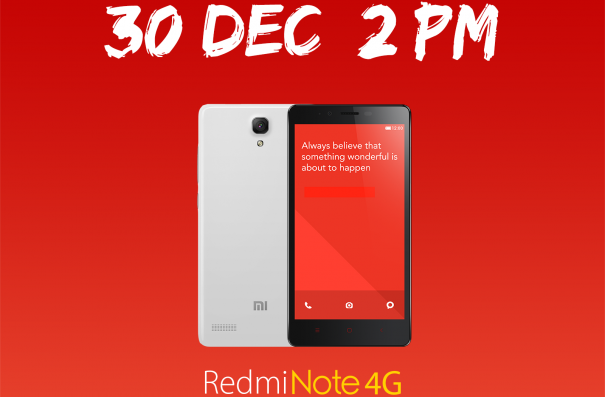 The Xiaomi Redmi Note 4G runs on Android v4.4 KitKat under its own MIUI V5. It boasts of a 5.5 inch 720p HD IPS display, 1.6 GHz quad-core Snapdragon 400 SOC, 13 MP primary lens at the rear and a 5 MP camera at the front. It also has a 3100 mAh battery.